Apple now has the highest market value (above $700 billion) of any private company in the world – Fortune. 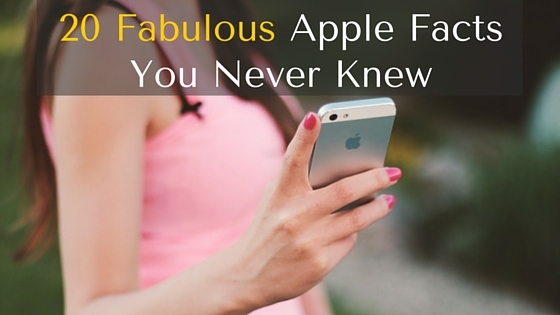 Most of us know Apple offered us iPhones, iPods, iTunes, Macs and many more, but you don’t know some amazing facts about Apple. The first Apple logo featured Isaac Newton? Did you know this? No! Would you like to enhance your knowledge? Here are 20 mind blowing and amazing facts you may never knew. 1. Apple Computer Inc. Was established in 1976 by three people Steve Jobs, Steve Wozniak and Ronald Wayne. And Ron Wayne left the company after two weeks. Apple’s co-founder sold all his shares for $800. Today, they would have been worth US$35 billion. 2. Jobs was forced out of Apple in 1985. After leaving Apple, Jobs founded a new company NeXT. Apple acquires Next in 1996, allowing Jobs to become the former’s CEO once again. 4. In 1986, Apple launched a clothing line. 5. Apple iPad’s retina display is actually manufactured by Samsung. Currently it is manufactured by LG. 6. Apple sold 340,000 iPhones per day in 2012. 7. Apple earns US$300,000 per minute. 8. Everything you say to Siri is sent to Apple, analyzed and stored. 9. Every Apple iPhone ad displays the time as 9:41 AM, the time Steve Jobs unveiled iPhone to public in 2007. 10. The World’s most valuable brands are Apple, Microsoft, and Google. 11. In Japan’s Apple Store, there was a fan who started waiting in line 7 months early for iPhone 6. 12. If you use iTunes, you have already agreed not to use Apple products to create nuclear weapons. 13. Samsung makes about 30% of the A8 chips that go into Apple’s iPhone 6. 14. The battery of an Apple Macbook could save you from a gunshot: it’s bulletproof. 15. Apple assign fake projects to new employees to make sure they can be trusted. 16. Apple owns the patent for “slide to unlock” feature. 17. iPhone users are more loyal than all other smartphone users. 18. Apple has over 80,000 employees around the world. 19. Smoking near an Apple computer may void its warranty. 20. Apple doesn’t ships its products; they all fly first class. Did you like these facts? Please share your views with us and if I’ve missed any interesting fact, please let us know what they are by leaving a comment below!